﻿﻿ RA-7死星机器人（RA-7 Death Star Droid） - Databank - 星球大战中文网 Star Wars China - Powered by Discuz! This particular model of humanoid droid is characterized by a build very similar to protocol droids, but with a striking insectoid-like face. Models of these droids were found aboard the Death Star, leading to their informal moniker of "Death Star Droids." Arakyd Industries curried considerable favor with the Empire with their exceptional line of military and security droids. For this reason, they were awarded the contract to supply some of the highest ranking officers in the Imperial echelons with personal servant droids. Or, at least, that's what the Imperial Security Bureau would have everyone believe. Arakyd delivered a lackluster assistant in the form of the RA-7. Its programming was substandard and it lacked the aesthetic qualities of leading protocol droids from Cybot Galactica. The droid's innocuousness was entirely by design; the ISB had tasked Arakyd to develop a line of spies to keep tabs on Imperials officials. Concealed in the droid's primary programming was a secret documentation/surveillance system. The RA-7s were programmed to make periodic and clandestine contact with their ISB masters via scrambled frequencies. Rumors began to circulate about the RA-7's true intent, and privacy-seeking Imperial officials began to quietly and conveniently "misplace" their droids, rather than destroy or reprogram them outright and risk being branded as traitors. A huge number of these droids were stationed aboard the Empire's most elite posting, the Death Star, and thus were destroyed when the station exploded. 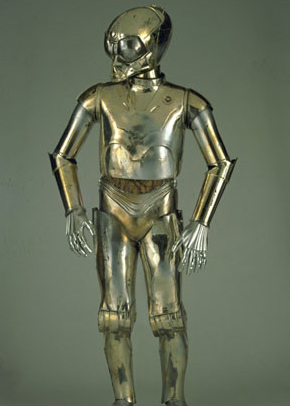 During production, the RA-7 servant droid was known as both the Death Star Droid and the Gold Insect Droid, the latter nickname reserved for the unit seen aboard the Jawa sandcrawler. 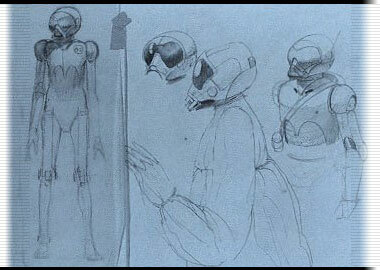 The droid's design was developed in sketches by Ralph McQuarrie.